Criminal Enterprise or Under-served DVD Market? Often the scourge of the entertainment industry, so-called “pirates” are often singled out as the single greatest threat to its very survival. The usual brush used to tar them paints them as high-level criminal enterprises with highly sophisticated money-laundering operations and connections to real criminal activities such as drug running and prostitution. Back in the day, they mainly produced counterfeit DVDs and video tapes but have since moved into cyberspace and make use of zombie computers to support their networks. All this ties into today’s post insofar that the decline of DVDs as a medium for content distribution has also meant a decline for these enterprises. Much can be said for the move into cyberspace but many a fan knows the difference between, say, The Pirate Bay and a dodgy website crammed with ads and a suspect video player requesting you download “special” codecs in order for it to run. This is a lesson I saw my brother learn the hard way with approximately 8 hours of his life that he’ll never get back spent cleaning up the resulting mess. 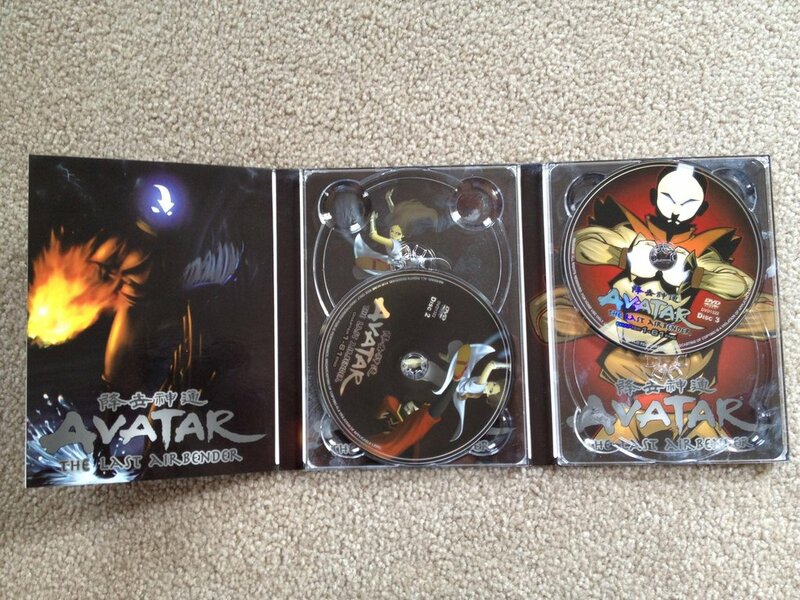 Yes, this is the entire series of Avatar: The Last Airbender available in a complete boxset. Now most American fans will have their suspicions immediately aroused because they know that the series never came out as a single boxset; only as three separate “books”. 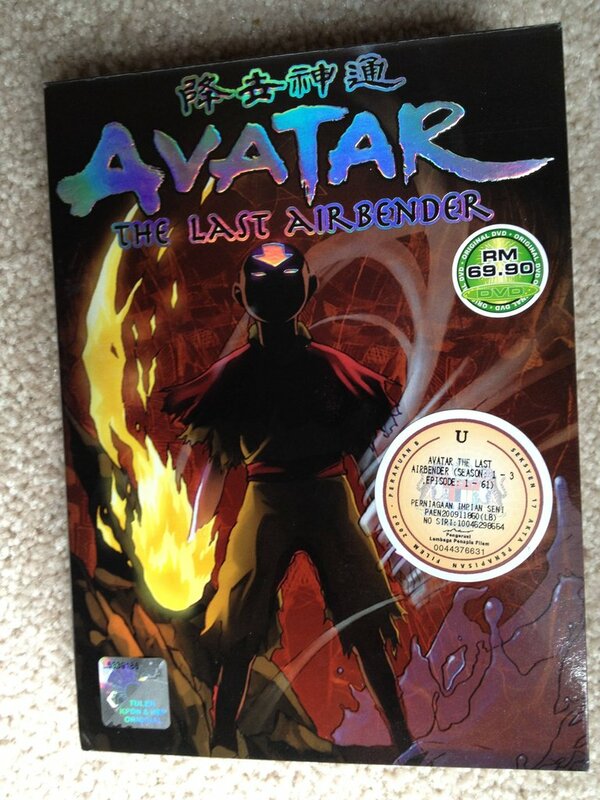 This is all before you notice the non-latin text adorning the back cover or the notable lack of a Nickelodeon logo. This boxset retails for $30 on eBay (no, I won’t link) whereas the official season sets retail for about $30 each. That’s a huge difference in price. Where does that difference come from and why does that matter? The first thing the studio will say is that these DVDs don’t include the cost of the show. That is true, but the way networks and media companies are structured, that’s only the half truth. The cost of the show is borne by the network itself, who then license it to their home video arms for DVD distribution. Those licensing costs aren’t cheap and make up a decent proportion of the official sale price. Second is the fact that this boxset is being sold direct from the far east, also the point of manufacture. There is no middlemen a la distributors or the distribution arm of Viacom, another source of expense as they take their cut. Lastly is the retailer themselves. Amazon knocks about $9 off the list price which in essence represents the extra efficiency they’ve managed to squeeze out through their distribution and sales systems. Anyone else (traditional retail outlets included) will absolutely stick to the $39.95 retail price because anything lower will eat into their profit margin. Now you could argue that these knock-offs are missing the special features like making-of videos, commentaries etc etc. but they are simply the icing on the cake for most fans and die-hards. Would the average consumer be willing to trade off the loss of the extra features for a 66% discount? I’d hazard a guess that most would. So in reality, these knock-off DVDs are less of a representation of criminal enterprise as they are an under-served market at the hands of inefficient interests. Nickelodeon could no doubt sell a series boxset for $30, if it wanted to. However with so many fingers in the pie from manufacturers to distributors to retailers, there are an awful lot of vested interests who would rather see high-priced individual boxsets that prop them up rather than a product in the consumers best interests. Much the same in how Maryland vineyards can’t sell their products online because distributors put up a political fight to keep their 35% take. So where does that leave the above boxsets on sale today? In a gray area unfortunately. Yes they are for sale and do represent good value, but they are unofficial. Money generated from their sale (and you can guarantee that there are profits being made) are not flowing back to the rightful people or corporations, regardless of the political stance you take on content and copyright. That is clearly not right or fair, but then neither is the rigid, inflexible nature the DVD market and requisite distribution operations. Animation could benefit greatly if superb series such as Avatar were allowed to be sold at the level that the market demands. A lot of free-wheeling economics I know, but if you thought the series was popular now, how much more popular would it be if a lot more people could own and experience the show that they love. While it’s easy to dismiss all fans as freeloaders, you’ll be glad to know that on the reddit thread discussing the set, the original poster was actually admonished for buying the set, and fans went even further to severely downvote the post with a link to where they bought it. So it’s not simply a case of fans willing to break the rules for a cheap deal, they really do care about the show and do prefer to go through official channels. One post even pointed out that simply downloading bittorrent files caused less damage to the creators than buying actual, physical discs from shady overseas operations. All in all, a tough case to analyse and an even tougher one to rationalise. Fans should be catered to, and clearly barring the unnecessary costs imposed by the network and distribution channels, someone has found a way to profitably sell DVDs for far less. Fans would benefit and clearly Nickelodeon would benefit too, however in this case, they receive not even a penny. Sure it’s breaking the rules, but it’s a lost sale in the real sense, and any businessman worth his salt hates to see money pass him by because of his own actions. So since diamonds are not readily available either.. I suppose they are in an “under-served” market. You people and your self-entitlements are unbelievable. My bank account is under-served as well, so next time I get my hands on yours.. I will take what I want.